Can an SR22 be withdrawn before the 3 years ? As a general rule, the court or Department of Motor Vehicles in your state may decide to ask for a SR-22 when you prove to be a handful on the road. This is a document that proves that you can be financially liable in case you get into an accident. While not all drivers are required to produce this document, people who have proven reckless on the roads in the past, have the tendency to break traffic laws or have been in fatal accidents will be required to have this document with them all the time as long as they are driving. You may be one of those people who the state has decided, have to carry a SR-22 wherever you go. You are probably already paying the price of having a SR-22 and are eager to get rid of it. Take heart, you are not the only one. A lot of people want to get rid of their SR-22 requirement but many have to wait for the mandatory three years period. So the question at hand is, is it possible to have a SR-22 requirement for less than three years and if so, how? Unfortunately, this question has no direct answer. While there are many ways a person can add time to their SR-22 requirement, the law does not stipulate any conditions that can be met to reduce the time one has to keep a SR-22. This is generally no less than three years. The only loop hole you may have is the time you have the document with you will be determined from state to state and may be determined by the reason you need the SR-22. Essentially what this means, is since the period you are caught in violation, the time you are convicted and the time you get the SR-22 are all different times, you may actually be in luck and keep it for a shorter time than actual three years. For instance, if a judge decided to backdate the SR-22 requirement by the period your case has been in court, and assuming it has been in court for about six months, then you are going to keep the SR-22 for just two and a half years. This is the only way your period of having to carry a SR-22 can legally be reduced. People think that not having a car changes your need for them to have the SR-22. Technically as long as you are not driving, you do not have to carry the document with you. However, as long as the record has not been dropped, you will require it. The record will be dropped only when the insurance company notifies the court that your three years are up. In fact, the assumption that selling a car to reduce your SR-22 requirement time, may be a mistake. The insurance company is mandated to notify court and the DMV once your insurance expires or you break ties with them. This therefore, may add you more time rather than reduce it for you. What you need to know is that time will never be reduced for you except for a very technical issue. It can however be added so you need to be very careful about how you are behaving as a driver. The easiest way for you, is simply never to have a SR-22 requirement. The SR-22 process can be complicated and quite confusing, that is why you need to consult a high risk insurance company like us. We will help you fill all the forms you need. We will guide and advise you on what you need to do during the period of the SR-22 requirement. You will not be baffled or struggle about it. All you need is to fill in a simple form with us and we shall take it up for you from there. Do not risk adding more time by consulting with people who are not professionals. 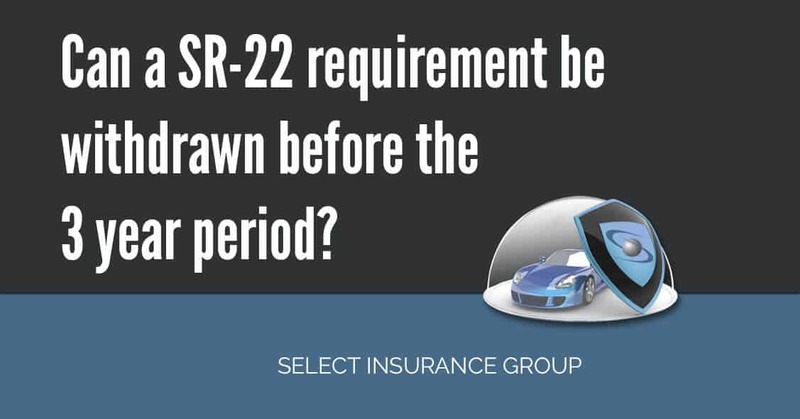 Remember, the more time you have with the SR-22, the longer you have to pay higher insurance premiums. Newer Can a person who has no vehicle have SR-22 ? Older What violation will increase time on SR-22 requirement?